No one told us it would be easy to wage a legal battle against the California State Lands Commission or power goliath, and convicted felon, PG&E. No one said it would be a walk in the park to go up against a corporate-mentality Superior Court judge to try to make our case against the Diablo Canyon nuclear plant in Avila Beach, on California’s Central Coast. We walked into the court room, were handed a typed 23-page opinion ruling against us. We were not surprised. We assumed from the onset we would end up in Appellate Court. “Of course, the Academy will be filing an appeal within the 30 days permitted by the rules, pointing out each of the errors the court committed on July 11, and fully expects to be successful on the appeal,” said Rinaldo Brutoco, founding president of the Academy. The Academy has long opposed the Diablo plant, on ethical standards and on scientific principle, which strongly indicates this plant is a ticking time bomb. 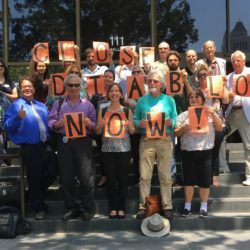 In August 2016, we filed this suit against the State Lands Commission and PG&E, operator of the Diablo plant, alleging the Commission did not have the legal authority to exempt Diablo Canyon from an Environmental Impact Report (EIR) required under the California Environmental Quality Act (CEQA). We maintain that substantial harm to people in downwind communities and the marine ecosystem at the plant will occur in the eight years leading up to Diablo Canyon’s proposed closure in 2025, as the aging plant reactors continually emit radioactive Strontium 90 isotopes and the reactors themselves become even more brittle. Among other things, the lawsuit argues that the California Secretary of Resources lacks the authority to create an exemption from CEQA, and therefore any exemption is invalid. The July 11 decision by Judge Mary H. Strobel, who heard the case without a jury, “was a gross miscarriage of justice, where the court committed more than three reversible errors by incorrectly applying statutory and case law,” said Brutoco. “Worse than the miscarriage of justice, however, was the court’s sweeping political position refusing to consider any evidence about the elevated cancer rates downwind from the plant, and the infant mortality statistics, which were presented by the leading researcher in Europe, and also its refusal to consider the seismic vulnerability of the plant, now that we know many earthquake faults that exist under and around it. These are some “goliaths” we’re fighting, but it’s what we’re here to do. We’re proud and happy to lead this charge and, as long as there is environmental injustice, we’ll never give up.